How can I find out how much it costs? All of our clinics include listings of their prices for each procedure they undertake. Getting a feel for the prices is as easy as clicking on the 'Procedures and Prices' tab on each clinic's page on our website. Not only does this give you the prices at that particular clinic, but you can also see - at a glance - what the comparable prices are at home, illustrated by the prices in grey which are scored out. This page also gives you an estimate of the time the treatment takes. If you are not sure exactly what treatment you will require, click on the ‘Get a Personalized Quote' button and a dentist will contact you to discuss your options. The length of time you will need to stay is really dependent on what kind of treatment you have. Some treatments, such as fillings or laser teeth whitening, can be done in a matter of hours. Other treatments may take place over a few days, or weeks, such as implants, and may require two visits 6 months' or a year apart. We can advise you how long your procedure is likely to take and how many visits you may require. There are good and bad dentists anywhere in the world, just as there are home. Finding out information is not only time-consuming but difficult to know if the information is accurate. Dental Departures has already done a lot of this work. We background-check all our dentists, including their qualifications and expertise. We visit all of our clinics personally, and undertake onsite inspections, in order to satisfy ourselves that every aspect of their dental care meets with our strict criteria. We also make sure we get honest reviews from real patients on their own experiences, that you can read on our website. The idea that low-cost dentistry equates to low-quality treatment is wide of the mark in the dental tourism industry. Just as you would seek out high-quality dentists with a good reputation for your treatment at home, the same advice is applicable to any dentist you would seek abroad. This is why it is essential to research your chosen dentist fully, by verifying their qualifications and experience, and by checking recommendations and reviews by their patients. We believe the measures we take enable you to get honest, accurate information about your prospective dentist, ensuring that your dental treatment will be the very best. Moreover, if you are worried about the locations of our dentists then there is no need. Our dentists tend to situated be in well-known tourist areas that regularly receive thousands of overseas visitors. Ordinarily, your experiences of our overseas locations should be no less safe than visiting an unfamiliar city or town at home. Can I see a Western trained dentist? Our overseas dentists have received extensive dental training, just like their Western counterparts. Indeed, many of our dentists have received training at Western universities and have accreditations with the American Dental Association, Australia Dental Association or British Dental Association. It is not uncommon for dentists in Mexico and Costa Rica to have trained in the US and Canada, Thailand dentists to have trained in Australia and New Zealand and European dentists in the UK. 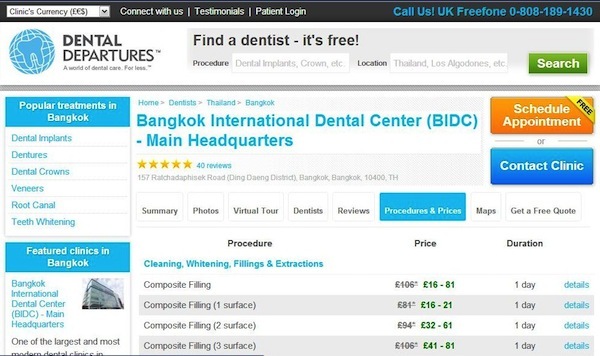 You will be able to find where your dentist has trained by clicking on the 'Dentists' tab under each clinic. Do the clinics use the same sterilization techniques? Although standards do vary from country to country, all of our dentists adhere to the same basic systems of maintaining hygiene as dentists at home do. All wear gloves and masks and use antibacterial solutions to cleanse surfaces. Steam Autoclave sterilization is used for sterilizing tools and equipment in every modern dental clinic throughout the world, and ours are no exception. Many of our dentists are also members of international organizations, such as the ISO (International Organization for Standardization) or the JCI (Joint Commission International). As many of our dentists are located in busy areas, there are usually lots of accommodation options available. Some of our clinics offer reduced rates at local hotels, and this information will be available in the clinic listing. There are also plenty of hotel websites. You will find a link on each clinic page to a hotel booking site where you can do your own searches. Alternatively, you can contact us and we will be happy to help you. Do the clinics have warranties? Our dental clinics' provide diligent and careful work based on established procedures, research and study. All of our clinics offer warranties on the work they do, as well as the materials they use. You can be confident that any crowns, bridges, veneers, inlays, onlays, dentures and dental implants are covered under warranty in the improbable occurrence that a fault occurs. Fortunately, the vast majority of our patients do not experience any problems with their dental treatment abroad, but no matter how expert a dentist is, problems can arise through no fault of their own. However, in the unlikely event that you do have any problems we are here to help. All of our clinics have warranties guaranteeing work for a year. Furthermore, you can be certain that Dental Departures will do the utmost to resolve any problems quickly and professionally. We are here to support and help you throughout every step of your care. No. Our service is completely free to patients. Can I speak with the dentist directly? Yes, of course. You can either contact us and we will arrange a mutually convenient time for you both to speak to each other. Alternatively, click on the 'Contact Clinic' button on the clinic webpage and send your request direct to the clinic. What kinds of dental treatments can I have overseas? Dentists abroad are trained in all areas of dentistry – just as they are at home. Your overseas dentist will be able to undertake all dental procedures, from minor dentistry such as fillings, through to extensive dental work, such as full mouth rehabilitation. The only bar to any dental work will be your own time constraints, and how long, or how often, you are prepared to visit a dentist in another country. For this reason, orthodontics (re-aligning teeth with braces) is not usually an option for dental tourism patients as it requires regular attendances over a period of 18 months or more. How much can I save by having my dental treatment overseas? It really depends on what procedure you are having done, and in what country. As a general guide, most people find they can save at least 50% on comparable costs at home. However, savings may be up to 80% on extensive dental work. 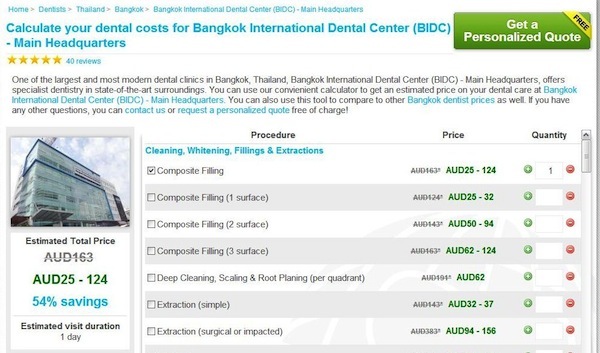 Why does it cost so much less to have dental treatment abroad? Many of the countries that offer inexpensive dental treatment have lower living costs. This means that all the overheads associated with your dental care will be considerably less. Reduced overheads include clinic rent, utilities, administration expenses, labor costs and laboratory materials. Are the materials used abroad as good (for example for dentures)? Have you ever wondered why lab work seems to take so long? It is not widely known but dentists at home often use the services of dental laboratories abroad. The reasons are two-fold – obviously this increases your dentist's profit margins considerably, but also with many labs having international certification, the craftsmanship and quality of materials is guaranteed to be on a par with dental labs at home. Is the technology available abroad as good? There is a common belief that overseas dentists use cheap, old technology. However, this couldn't be further from the truth. Many dental clinics abroad are modern and fitted with state-of-the-art gadgetry. It is not uncommon to find clinics fitted with, for instance, intra-oral cameras, digital panoramic x-rays and the latest diagnostic equipment as standard. Do I need to tell my dentist at home? That is entirely your choice. However, you may need to obtain digital x-rays from your dentist to forward to your overseas dentist. Be prepared for your dentist advising you against treatment abroad – not necessarily because they won't be getting your money, but because they will be concerned for your health. This is why it is imperative you select a high-quality dentist with a good reputation, and why Dental Departures can help. We offer very competitive rates and any treatment you have through us will be less than you have been quoted elsewhere. If you are undertaking multiple procedures we guarantee that the price you are quoted will be less than anywhere else.